Featuring 10 box designs and over 400 pages of double-sided origami paper, this pack has everything you need to think "outside the box" with your origami! 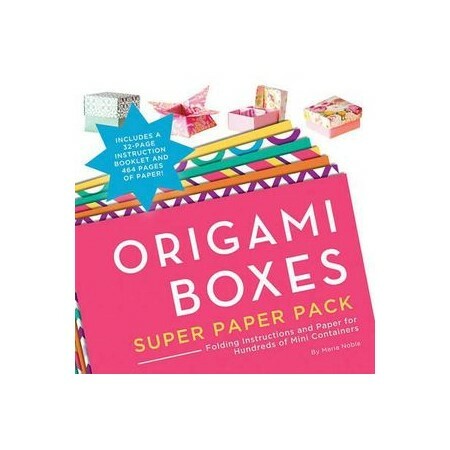 This pack includes step-by-step instructions for 10 origami boxes of all shapes, some with lids and some self-closing, and 464 sheets of origami paper in more than 30 different colors and patterns, printed on both sides, and bound into the book for easy removal. Let your imagination spring to life as you mix and match colors, textures, and shapes to create one-of-a-kind boxes. No previous experience or materials are required--everything you need to jump into making origami boxes is included in this pack. It's a perfect gift item for yourself or anyone you love! Maria Noble is the author of How to Make 100 Paper Flowers. Her lifelong passion for making flowers began as a child, when she watched her mother and aunt run a floral business. Using innovative methods, they made beautiful flowers from fabric, paper, and other materials for weddings and special events. Maria started her own business ten years ago, incorporating her inherited skills and exploring ideas of her own to create new, distinctive flowers. Her exquisite flowers are now sought out by consumers and businesses nationwide, including leading event planners in New York and Los Angeles. Maria lives in Avon, Connecticut, with her husband and two children.